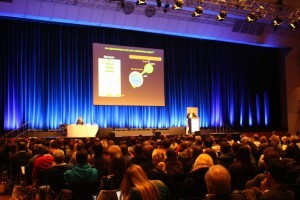 From 9-13 November 2014, over 1000 neuroimmunologists from all over the world met at the 12th International Congress for Neuroimmunology in Mainz. 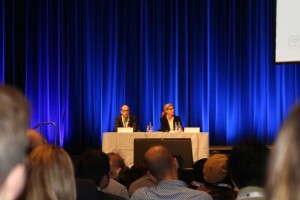 With 70 invited speakers and 40 chairs representing experts in the field, as well as 50 early career researchers selected to present their research and hundreds of others presenting posters, the scientific program was varied and stimulating, showcasing the newest and most exciting developments in the field of neuroimmunology. 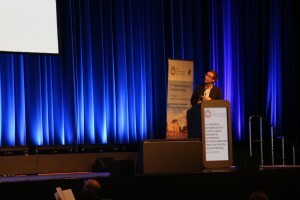 The success of the conference was thanks to the local organizing committee consisting of prominent neuroimmunologists from Germany, Austria and Switzerland. Among them were most of the members of the CRC-TR-128 Steering Board, and in particular Frauke Zipp and Ari Waisman were the conference chairs. The 12th ISNI Congress was a particularly important event for the CRC-TR-128, as multiple sclerosis was a central theme of the conference. Many of our principal investigators were invited speakers and chairs, and 70 additional members attended. The CRC-TR-128 also sponsored a symposium for early career researchers to present their work in the area of neuroinflammation. You can also see Frauke Zipp talking about MS at the conference in an interview with the SWR Landesschau Aktuell (in German).